Man accused of climbing onto school bus on Mass Pike summoned to court. 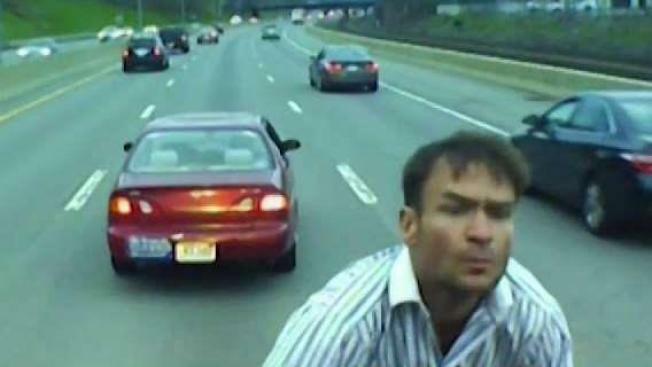 The man caught on dashcam video jumping on the hood of a school bus in the middle of the Massachusetts Turnpike in Newton earlier this week has been issued a summons on numerous charges. The 42-year-old Dorchester man, whose name was not released by police, is charged with disorderly conduct, negligent operation of a motor vehicle, failure to use care in stopping and a marked lanes violation. He is expected to appear in Newton District Court at a later date. State police also said they have submitted a request to the Registry of Motor Vehicles for an immediate threat license suspension/revocation. On Tuesday, for reasons that remain unknown to police, the man was traveling westbound on I-90 and stopped in the middle lane. The school bus, which was unoccupied save for driver Joseph Rizoli, was forced to stop behind the man's Toyota Corolla. Video footage from the Weston Public School bus shows the incident taking place in its entirety in broad daylight. The man exits his car and tries to enter the school bus via the side door, but is denied access by the driver. After his plan of entry fails, he jumps onto the hood of the bus. Eventually, the man got off the hood and Rizoli was able to drive away. "I think the guy has some serious mental problems to stop a school bus going 50 mph on the Mass Pike in the middle lane," Rizoli said. "I don't know what type of person does something like that... The guy stopped in front of me and I had no idea what he was doing. I'm like 'This guy's crazy.'" No students were on board the bus at the time of the incident. The Weston School District said it is investigating the incident.